Which layer in the TCP/IP model is used for formatting, compressing, and encrypting data? What is an example of network communication that uses the client-server model? A user uses eMule to download a file that is shared by a friend after the file location is determined. A workstation initiates an ARP to find the MAC address of a receiving host. A user prints a document by using a printer that is attached to a workstation of a coworker. A workstation initiates a DNS request when the user types www.cisco.com in the address bar of a web browser. Two students are working on a network design project. One student is doing the drawing, while the other student is writing the proposal. The drawing is finished and the student wants to share the folder that contains the drawing so that the other student can access the file and copy it to a USB drive. Which networking model is being used? What do the client/server and peer-to-peer network models have in common? Both models have dedicated servers. Both models support devices in server and client roles. Both models require the use of TCP/IP-based protocols. Both models are used only in the wired network environment. What is an advantage for small organizations of adopting IMAP instead of POP? Messages are kept in the mail servers until they are manually deleted from the email client. When the user connects to a POP server, copies of the messages are kept in the mail server for a short time, but IMAP keeps them for a long time. IMAP sends and retrieves email, but POP only retrieves email. POP only allows the client to store messages in a centralized way, while IMAP allows distributed storage. Which application layer protocol uses message types such as GET, PUT, and POST? When retrieving email messages, which protocol allows for easy, centralized storage and backup of emails that would be desirable for a small- to medium-sized business? The source MAC address is 48 ones (FF-FF-FF-FF-FF-FF). The destination IP address is 255.255.255.255. The message comes from a server offering an IP address. The message comes from a client seeking an IP address. 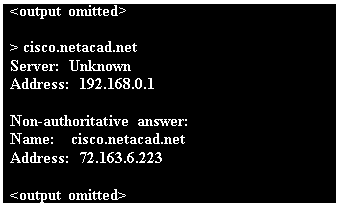 All hosts receive the message, but only a DHCP server replies. Only the DHCP server receives the message. What part of the URL, http://www.cisco.com/index.html, represents the top-level DNS domain? Which phrase describes an FTP daemon? Which statement is true about FTP? 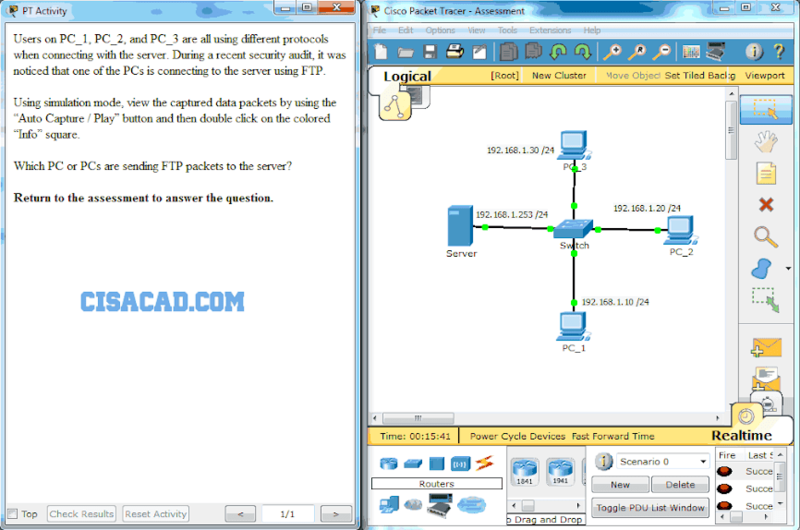 The client can choose if FTP is going to establish one or two connections with the server. The client can download data from or upload data to the server. FTP is a peer-to-peer application. FTP does not provide reliability during data transmission. What is true about the Server Message Block protocol? Different SMB message types have a different format. Clients establish a long term connection to servers. SMB messages cannot authenticate a session. SMB uses the FTP protocol for communication. Which application layer protocol is used to provide file-sharing and print services to Microsoft applications? The HTTP message type used by the client to request data from the web server is the (GET, get) message. Which PC or PCs are sending FTP packets to the server?